The US consumer can't catch a break. As if rising food prices weren't enough - with corn prices at record highs and other food prices expected to move higher next year - we now also have a sharp increase in gasoline prices. 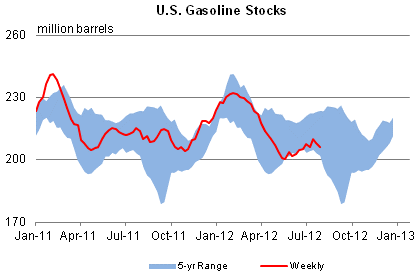 US gasoline inventories have declined more than expected - close to the lower end of the 5-year range. 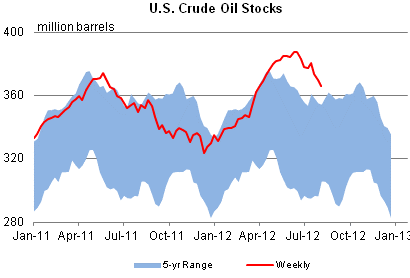 And US crude oil stocks also came in below the forecast (though still above the 5-year range). That sent gasoline prices sharply higher. 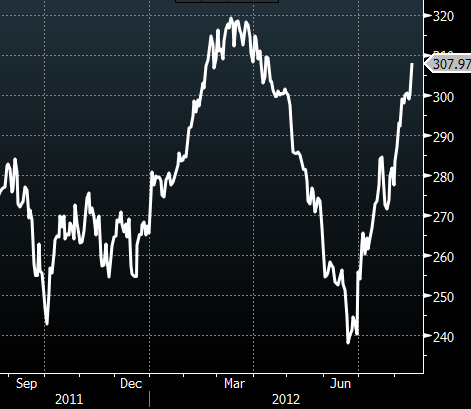 NYMEX Futures have now retraced most of the spring 2012 declines. Bloomberg: - Gasoline futures jumped to a 14-week high on lower inventories, higher demand and rally in Brent crude oil. Futures gained 2.3 percent as the Energy Department reported gasoline supplies dropped 2.37 million barrels to 203.7 million, the lowest level since the week ended June 15 and the lowest for this time of the year since 2008. Wholesale demand jumped to a 13-month high. Rising Brent prices increased the price of imported crude and gasoline. “Combine that storage report with the strength in Brent today and you get a 5-cent move,” said Addison Armstrong, director of market research at Tradition Energy in Stamford, Connecticut. Rising food and gasoline prices may materially dampen consumer confidence and push the "headline" CPI number to uncomfortable levels. High fuel costs will also impact the Eurozone, deepening the recession in a number of nations (next post).